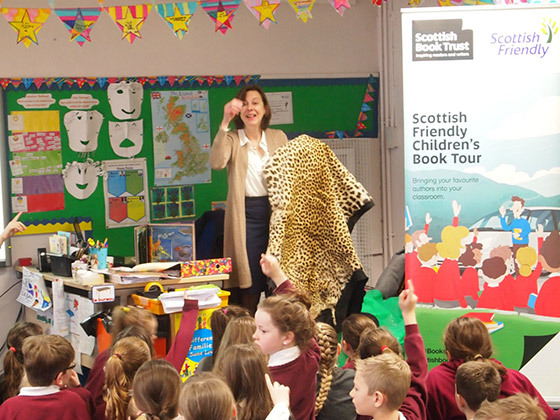 Taking authors on The Scottish Friendly Children’s Book Tour is always full of surprises, but when a real leopard skin, hippo tooth and a rubber duck sprang out of Christiane’s suitcase, as if from one of the pages of her amazing pop-up books, we wondered what we had let ourselves in for. All would become clear over the course of the week, as Christiane fuelled more than 350 pupils’ natural curiosities and instincts to question the world around them, explaining that it was the thousands of unanswered questions she had as a child that inspired her to write such beautiful and engaging non-fiction books. Christiane shared stories of growing up around nature in Canada and astounded pupils with mind-boggling facts about the formation of the Earth and weird and wonderful animal trivia. Did you know that sloths only make one long, slow journey from the canopy to the forest floor once a week to poo? Or that if you compressed the billions of years that have passed since the universe was formed into 24 hours, the existence of man would be less than a second? Neither did we! Christiane’s previous work with WWF meant pupils were able to see some real life artefacts such as a leopard skin, elephant tusk and hippo tooth obtained from poachers by the WWF. Some were dismayed and sad, others curious and amazed, but most importantly it encouraged everyone to think about the bigger issues around sustainability and environment and come up with their own ideas, to become the scientists of the future. Some came up with tricky riddles about their favourite animals, while others invented a machine powered by renewable energy. Albert played his part as well, tweeting photographs of our journey every day and telling the story of how scientists are using rubber ducks to track deep sea currents. A huge thank you to Christiane and to all the schools we visited for a fantastic week! Congratulations to Emma Perry from West Suffolk, who won a signed copy of How The World Began in our Christiane Dorion competition!